After wading through my previous rather heavy and controversial posts, I thought everyone deserved something a little more light-hearted today. Many of my commenters send me links to stories they found interesting and often they point out things missed by most of the blogs and sites. This morning my son, Mad (who designed and built this blog), has been sending on links from his friend, Lee, who also comments on my posts occasionally - and there are some odd little snippets amongst them. I decided it would be good to pass them on to my readers and so here are three, together with my thoughts on their stories - thanks, Lee. The first comes from Planet F1 and concerns Fernando Alonso's comments on the penalty dished out to Hamilton in the Fuji GP. It seems that 'Nando is happy to give his opinion, whether informed or not - and that rather puts other drivers' comments on competitors' penalties into perspective. They are not quite the unbiased experts we tend to assume. Then we have an amusing little conspiracy theory from the BBC. This one is pretty imaginative, mainly because the writer gets most of his facts wrong. It is true that BMW was the other team specifically mentioned as having a flexi-floor in the controversy from early last year. What is not mentioned, however, is that about half the grid also had the tweak. If that is evidence of collusion between Ferrari and BMW, a lot of other teams must have been involved as well! I presume that the reason the writer thinks that only BMW and Ferrari have had trouble heating their tyres this year is because Nick Heidfeld has had the problem. Kubica does not, however, it being more a matter of driving style that led to Nick's difficulties, rather than any similarity in design between the two teams' cars. There is one team that has had even worse problems in this area than Ferrari and that is Toyota. Somehow I doubt that this is the result of shared information between the two; it was not that long ago that Ferrari were quite annoyed at two employees of theirs who took secrets to the Japanese company. In fact, the BMW F1.08 is a very different concept from the Ferrari F2008 and the idea of some sort of cosy relationship between the two teams is quite laughable. If BMW have made big strides in the competitiveness of their car since they bought the team, it is through planned development and not following the herd in their design philosophy. Finally, there is a post on the McCabism blog that I hardly dare comment on. Most of what it has to say about Alan Donnelly I knew already, but the information regarding the judge in Donnelly's libel action is new to me. Funny the connections one can turn up when one really digs, isn't it? I'm glad i am reading this blog as my main blog, and not those other pages. Seems this is the only page where the reality is truly and thoroughly investigated and reported. That said, i have noted a slight bending of your preference from BMW to McLaren in the later part of the season. Is this because you think Hamilton have received to much hammering from other places this year? And last, i know i probably should keep my mouth shut on this subject, but i can't resist. It really looks like Alonso haven't grown up one bit since he left McLaren. What comes out of his mouth never stops surprising me. I actually feel sad for Nelsinho for having him as a teammate. You're right that I'm tending to write more about Hamilton and McLaren these days, Björn. There are a few reasons for that, most obviously because they get into the news more often - and I think some of the Hamilton bashing that goes on is just ridiculous. I still support BMW and Heidfeld, however, and would write more about them except that I don't want to bore my readers. Just because I watch that team more than the others, it doesn't mean that readers do too and so I limit the number of posts I do on them. The ideal would be too write the same amount for each team but that is probably impossible. I try to look at the less popular teams occasionally, particularly Force India, but, when I get to Honda there is never much to say. We all know the disastrous season they're having and it's probably kinder to avoid repeating it constantly! Do you know, I wish I understood Spanish. And while Fernando and me aren't exactly BFF (not for lack of trying on my part) I have met him at the 2005 Oz GP, 2007 Oz GP and 2008 Oz GP and based on my own observations I do not beleive he is the sulky, petulant and immature person he is portrayed to be by some facets of the (lets face it, mostly British) media. Maybe his mouth does run away from his head occaisonally, but he is human after all. And who among us doesn't wish that on occaison we had just kept our mouths shut? In fact some people need an operation to surgically remove their foot from their mouth ! I agree, Peril, but, when you put this one together with the more widely reported statement of his intent to help Massa to the championship if he gets the chance, it does seem that Alonso is putting his foot in his mouth just as often as Hamilton does. It would be best if they all learned from Kimi and were to say nothing to the loaded questions that reporters fire at them! That is why I suggested that we take these quotes from drivers with a large pinch of salt, especially when they are being asked to comment on their competitors. hmmmm. and here i was, thinking he was just another driver taking an occasion to depart from the usual corporate speak. or maybe taking the p**s out of yet another really boring f1 media question. are they really so stymied by the spectre of the wrath of mssrs. e & m that they can't think of anything more interesting to ask drivers? but onto what i find a bit more interesting-because really i had never paid attention to anything about alan donnelly until recently: how does any of what he's ever done with his life qualify him to be a f1 chief steward? Oh, that's easy, Vera. He's Mosley's best buddy - that's all you need these days. Thank you for clearing up the BMW conspiracy. I did comment on the post in question stating that although I do not believe that BMW would be in colusion with the Devil, nothing would currently surprise me in F1 at the moment. Although I knew alan donnelly had a company which had done work for ferrari I never knew he was an active labour party member. How does he have time to do all these things and still manage to advise the stewards using his vast experience in F1? I wish ITV and the other channels would highlight this to those fans who do not do as much reading as those on here - after all it is a slighlty important issue when he is advising on punishments and racing incidents etc. I am sure that their views of hamiltons punishments would change as a result. Fernando is proving himself as immature. What I can't understand is why when hamilton makes a stupid remark everyone hates him yet when Alonso does the same he is almost hailed as a hero. They both need to learn to be more tight lipped. So, now we have drivers who likes to speak their minds and I think that this is interesting to the sport. If, per chance, anyone has recorded the last race although I know perfectly well nobody would think of ripping off poor Bernie, I suggest you check out the look on Alonso's face when Piquet gets a complement from the interviewer. Who ever is his team mate is in for a bad time. He will probably want Fisichella back as he knows he will not be a threat. Perhaps the whole of F1 management should move to Sicily? They might find another group there with the same ethics and morals. Hamilton's competitors will obviously try any "legal" tactics they can to beat him including trying to psyche him out or get under his skin. The influence of M&E and there manner of handling F1 have far reaching effects. They lead by example so the rest lower their standards. 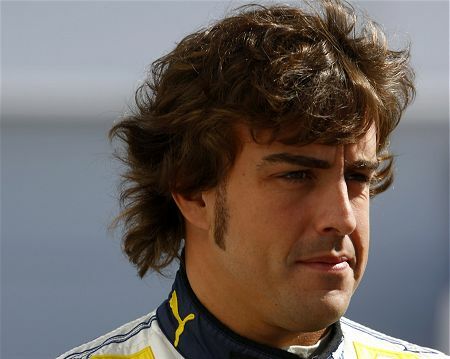 Watching Alonso trying to brown-nose he`s way into Ferrari is quite cringeworthy, though why they didn`t sign him is a mystery to me , as they were obviously made for each other. Lee: I think Alonso often makes comments to deliberately annoy his competition (Hamilton in particular) and this may be an example. There was a race last year (can't remember which one) that Alonso won after Massa had nearly pushed him off the circuit as 'Nando was overtaking him. As they dismounted from their cars afterwards, Alonso said a few things to Massa and the little Brazilian nearly exploded with rage. Alonso kept it going as they prepared to go up to the podium and then left with an enormous grin on his face. Meanwhile Alonso was still apoplectic and telling everyone who would listen his side of the story. It was so obvious that the Spaniard was winding up Felipe all along. Quite honestly, I think Hamilton isn't given as much leeway as Alonso in his public statements because the Brit's hype has raised expectations too far. Do that with anyone and there are those who can't wait to bring him crashing down from his pedestal. It happens repeatedly with British sportsmen, the hype asking way beyond their capability and then lashing back when they fail to deliver. Nick: Good point. When the officials are corrupt, what hope is there for the competitors? I suppose we should be grateful that there are still those like Raikkonen who are not prepared to stoop to their levels. Gusto: With Kimi signing on for two more years, it looks as though Alonso will have to wait a while before he gets that coveted Ferrari seat. I'll give him his due, however - he knows how to drive and will be hard to beat in the red car. Lee - I assume your comments re Nando were directed towards me. Make no mistake, I am not so one eyed that I'd agree with Nando if he said grass was blue. In fact there are comments from me on this very site criticising some of his behaviour from last year. Perhaps I am on a one-woman crusade to 'restore Alonso's reputation' as I hear it referred to time and time again, but it really annoys me how he has been demonised over the whole saga last year, when Hamilton & Dennis emerged smelling like roses. I think he is used by large parts of the media to create hype & sell more papers, and that a lot of what is attributed to him prolly BS. No my comments were not aimed at you at all and I am sorry if it came across that way. I was merely pointing out that Hamiltons poor comments this year have been more to do with inexperience and probably anger with the FIA than anything else. Fernandos however seem to be a lot more planned and are still ridiculous yet everyone is jumping on hamilton yet find Alonsos comments fine. I think they are both wonderful drivers but they both need to keep quiet and just race.